KJIPUKTUK (Halifax) – A proposed Environmental Bill of Rights for Nova Scotia was launched today, Earth Day, by a group of environmental activists who gathered at a packed Wooden Monkey Restaurant in downtown Halifax. The Environmental Bill of Rights is intended to sit on top of existing legislation, giving environmental laws teeth and offering mechanisms to allow communities a real say in decisions that will affect them for generations. “We have a Nova Scotia Environment Act, it is a good act, but often it is not enforced,” said Lisa Mitchell, executive director of East Coast Environmental Law (ECELaw), an organization that pushes for stronger environmental laws. Establishing the right to a healthy environment, and creation of an environmental commissioner, an environmental rights tribunal, better access to information, and a better ability to go to the courts are some of the key attributes of the proposed Bill of Rights. “We need an environmental commissioner, an independent body you can go to when you have a concern. One of the key things we environmental lawyers notice working with affected communities is that they can’t get the information they need and they can’t get an advocate within the Department of Environment,” Mitchell said. Representatives of several Black, Mi’kmaq and other communities spoke to exactly that lack of consultation and powerlessness that they encountered in the past, and are still experiencing on a daily basis. Marlene Brown, a resident of Harrietsfield whose water is polluted by leaching recycling plant, reflected on the difficulties of simply finding out what is going on. Raymond Sheppard’s story of a sequence of dumps and landfills in the Black community of Lincolnville echoed Brown’s sense of being stonewalled by government. “During the last 50 to 70 years many people in the community developed illnesses. Today our community is on life support. The average age is 65 and older. Many have left, simply because there is a fear of our toxic environment,” said Sheppard. 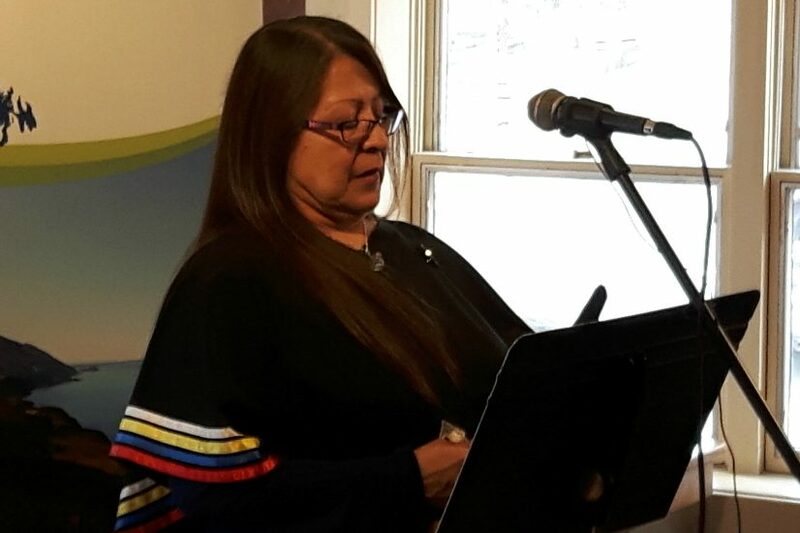 Dorene Bernard of Sipekne’katik (Indian Brook) First Nation spoke not only of her fight to safeguard the Shubenacadie River system from the threat posed by Alton Gas, she also talked about the damage done to her community by a gravel mine affecting the aquifer that provides the community with drinking water. “The water is contaminated,and people in our community have high levels of cancer and illnesses. The sandy gravel mine must stop, she said. Louise Delisle, a resident of a black community within the boundaries of the Town of Shelburne, spoke eloquently of the devastation brought to her community by a town dump. “This is a community of widows. Families in the South End of (the Town of) Shelburne are facing serious health and economical issues because of the deaths of so many Black men in our community,” said Delisle. We visited with Louise Delisle earlier this year, and you can read our report here. Finally, Jonathan Beadle, of Pictou Landing First Nation, talked about the terrible suffering caused by the nearby pulp mill, for decades actively supported by a sequence of racist governments. But Beadle drew hope both from the government’s recent commitment to address the damage done, as well as from today’s actual launch of the Bill of Rights. The Environmental Bill of Rights is the result of years of work by the Nova Scotia Environmental Rights Working Group, a coalition of environmental groups and individuals such as ECELaw, Dr. Ingrid Waldron’s ENRICH Project, the Ecology Action Centre, and the Sierra Club. You can read the actual Bill, and find additional information here. If you can, please support the Nova Scotia Advocate so that it can continue to cover issues such as poverty, racism, exclusion, workers’ rights and the environment in Nova Scotia. A pay wall is not an option, since it would exclude many readers who don’t have any disposable income at all. We rely entirely on one-time donations and a group of 25 or so dedicated monthly sustainers.